Born in the fires of Valhalla, Iced Earth is the Gold Standard (so to speak) for all America Power Metal. Iced Earth over the years is one of those bands that has continuously been able to change singers and change direction musically and be successful, at least more successful than most, which I think in part is because they’ve always given the fans what they want and have stayed true to their story-telling aspect that makes them so unique, not so dissimilar from Iron Maiden, just sadly not reaching that high of a peak. I received the latest Iced Earth album today Incorruptible and as it popped up in my email I got incredibly excited because it felt like on their last album they had begun a new chapter in their incredible saga when they added the vocals and lyricist Stu Block. This album marked the second effort with Stu and a follow-up from the fantastic “Plagues of Babylon,” which I thought was just a great introduction to Stu, much better than Tim “Ripper” Owens introduction because I felt like the band was at a strange empass at that point and in some ways trying to find themselves. That said, I hit “play” and wow, Great Heathen Army just absolutely took me on a journey very quickly, almost a journey of the history of Iced Earth themselves. I’ll get back to this shortly, but what I mean by that specifically is that the special thing about what Stu brings to the band past his presence, is his ability to mold the old with the newer, taking what was done vocally in the early years of the band from what Gene Adam and John Greely did to taking the fan favorite Matt Barlow style and bringing them together to bring us this new, yet kind of old style. 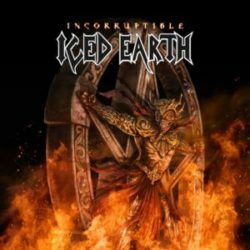 This album is epic, as are most Iced Earth albums, but epic in a really heartfelt way, kind of the same way that “Something Wicked…” did, taking us through journey’s and fast, aggressive heavy metal mixed with ballad’s that speak to each and every one of us. One thing I’ve realized over the years is that Iced Earth is built on solid heavy, fast rhythms just as much as it is built on incredibly strong vocals and presence, which is what I think Stu brings to the band. With all of that said, I also think the album tends to drag in places with tracks like “Raven Wing”, ”The Veil”, and “The Relic” sitting right smack dab in the middle of the album lumped together. The whole album opens so strong, and closes very strong with the ballads we’re so accustomed to from Iced Earth, but I do wish that I didn’t want to hit the skip button in the middle of the album. But all in all, this is definitely the second album of 2017 that I was long awaiting for and it gives us IE fans everything that we could have ever wanted from them. Now we just need those tour dates!